This was not the best of times for Arsenal. September ended with a 1-1 draw away to Man City and a 1-2 home defeat by Chelsea. Then came a handy 3-1 away win at West Ham before the international break, followed by a 1-0 defeat away to Norwich after the break. Somehow we had to get back on track. The talking point was the return of Super Boy and Untold did its bit to lighten the mood a little with a preview of the game in which Billy the Dog discussed tactics with Dennis Bergkamp. That is republished below. After that we have two commentaries on the game, one from Untold and one from Gf60. The net result was a spot of relief, but things didn’t seem too clever. Of course none of us knew what was going to happen during the coming week. When we found out we couldn’t believe it. On Tuesday we play Reading in the Diddly Widdly Cup! I know this because on the official Reading FC site (which is just about the most incomprehensible web site of any Premier League club) it tells me everything with ! at the end of each sentence! If you want to go the tickets are £25 adults, £20 17-21s, £20 65 & over; £15 16 & under. Compare and contrast with the prices that would have been charged at Arsenal – £10 upstairs, £5 downstairs. Will we see any shock horror news about Reading charging 250% of the price Arsenal charge? I did point out that this made it a 13 man team Dennis told me that Wilshere was so good that it appeared there were two of him half the time. Or more. Or less. which I thought looked ok. It was at this moment that Mr Wenger, armed with his pitchfork and wheelbarrow joined us for our regular pre match tête a tête in the potting shed and agreed to be quoted provided I got the circumflex accent in the right place. Mr Wenger calls Wilshere’s game his “little burst”, and he thinks this could be a shake up for the club. Dennis agreed suggesting QPR will set the bounds on Santi Cazorla, and in fact the howling was heard all over London this morning. Oxlade-Chamberlain is ok to play I am told. Then it is the eternal wait for Theo Walcott, Abou Diaby, Kieran Gibbs and Wojciech Szczesny. 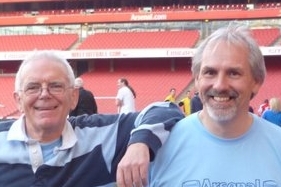 We spoke too of Bacary Sagna and suggested dropping Wilshere from left back and playing Sagna there instead of Santos. Or perhaps Thomas Vermaelen at left-back with Laurent Koscielny in the middle. But that would leave us with only six Wilshere’s on the pitch and everyone agreed that was not enough. “It is important to bounce back,” said Mr Wenger as his wheelbarrow got stuck in a pile of mud for which Enfield is justifiably famous. “Arsenal have won more corners than any other premier league team,” said Dennis. As for Questionable Perverse Ricochets (or QPR as they are known) they at top of the first division if you turn the league table upside down. The Ooze is their manager, so we know what to expect. And here is a snip. Did you know that Liam Brady scored his first goal, Bob Wilson played his last game and Alan Ball broke his leg – all in the same match against QPR? 30 April 1974. Arsenal came 10th in the league that season, followed by 16th the next season and 17th the season after. The manager was… Bertie Mee. Last time around it was QPR 2 Arsenal 1 (Walcott), in March 2012. And before that Arsenal 1 (van Persie) QPR 0, December 2011. But Dennis reminded me of QPR 0 Arsenal 6, FA Cup, January 2001. So if you want to show off, you can give us all details of why Dennis remembered that. And what was special about December 31 1994? Arsenal have six yellows this season QPR 13. Oh whoopee, whoopee. Break out the champagne; run up the flags and the bunting and give the kiddies extra pocket money. Jack and Bac are back. We beat the bottom club reduced to 10 men with an offside goal scored from a massive 2 yards. Just what we’ve all been waiting for. 3 juicy points thanks to the Italian Stallion who saved an embarrassing moment at the end. And we stopped Zamora (our substitute Drogba) from scoring. Not a day to remember but better than a slap on the bum with a wet lettuce. Just. …there were little in the way of highlights. Bac who replaced the very unlucky to be dropped Jenkinson was one of them. As was Jack the Lad for the first forty minutes or so. Fitness versus match fitness are totally different animals. He was struggling before he got clobbered by Granola who by then, shouldn’t have been on the pitch. Watching the lad clutching his ankle gave me (and probably every other Gooner) a heart in the mouth moment. Rambo hit the bar with a header. That just about sorts out the highlights. Santos wasn’t as bad as against Schalke though Wright Philips gave him a few scares. We looked better when Theo came on. He may well start now that Vinho’s injured himself. And an interesting fact from “Arseblog by the numbers”… 39 – Shots between Arsenal’s 3rd goal against West Ham and the goal against QPR. Our shooting is bloody awful and our next league game may just need a dramatic improvement in the conversion rate! Well this is a better day to be a Gooner. A narrow but fully deserved 1-0 win over a team that came for only thing: destroy whatever football is if possible. We have seen another exhibit of time wasting and bending the rules till it get ridiculous. But the amount of time wasting we have seen was again unseen before. And our friend the ref? He stood there and …did nothing. Now of course it could be that he didn’t noticed the time wasting. But then I can only ask myself: how on earth did he get there? That is something that as a ref you should be aware that it can happen and then you have to act and stop it. I have seen a few refs doing this very well this season (Clattenburg just to name one) so one can assume that a ref in the PL must have heard of the notion of time wasting before. This ref on the day seemed to have never heard of it and didn’t do anything about it. Another thing he didn’t seem to know was that when a free kick has to be taken the wall has to be 9.15 meters away or 10 yards. And this has to be the distance WHEN THE BALL IS KICKED! Because on almost every occasion the ref put the wall at about the correct distance. But then he allowed the wall to come forward again and so on a few occasions the wall was at some 6 meters distance away from the ball. And thus making it impossible to produce a decent free kick. Surely a ref in the PL has to be aware of the phenomena of a wall encroaching by taking little steps over the ground without lifting their feet. An invisible moonwalk one could say. How on earth can a ref not notice this? How on earth can he not notice that the wall is no longer in the position he put it in the first place???? How on earth can a PL ref let this go so many times? Okay it can happen once. But twice means you are not paying attention. But almost all the time…it means that you are not suited as a ref in the PL. And then we have not just the time wasting from QPR but the time wasting by …the ref himself. I think he was the only person in the ground to not notice the fact that one team (QPR) was doing all it could to stop the game flow. And I think he was the only person in the ground to not notice the fact that one team (Arsenal) was doing all it can to keep the game at a high tempo. Of course he noticed this. And if not: just another example of hem not being fit to be a ref in the PL. On almost any occasion when Arsenal had a free kick close to the QPR penalty area he used over one minute of game time. First he had to discuss with almost every player on the field what was going on, what they would have for dinner later this evening, the colour of the grass (which was rather green), it took ages before he even started to put the wall in the correct place. And then he had to chat with the players in the wall about some facts that we cannot know. But I surely hope he didn’t tell them that they could not move forward to the ball. It looked like that but surely… then he should have punished it. But he didn’t. So what was he wasting Arsenals, yours and my time? It just took ages to get everyone ready and by the time the Arsenal players could consider taking the free kick the wall was standing just a few yards away again. Time and time again. Missing it once can be excused. Missing it twice raises questions. Missing it all the time shows that either you are completely unfit to be a ref in the PL or…. So he was inept when it came to time wasting from QPR. He was inept when it came to putting the wall at the right distance. He was inept by wasting time when Arsenal wanted to take a free kick. I leave the rest of his performance to the ref reviewer but this was something that made my ref blood boil. And then to add to the insult of being a poor….or was it a biased ref, he did something extraordinary at the end of the 90 minutes. Now I know that when a team has wasted a lot of time and has bent the rules that if they lose when the time is up I will not allow them extra time. If QPR wanted to equalize of win the game, they should have hurried up a bit in the 90 minutes. And now with all the time wasting they got rewarded with 5 minutes of extra time to rescue a point. And it was QPR that had wasted all the time! And yet the ref gave them 2 extra minutes outside of the more or less mandatory for the substitutes. I think that made it clear that he was a man with not that noble intentions. All his failures and all those failures going against Arsenal gave me the impression that he was once again trying to do his best to step in the footsteps of Dean in the previous seasons. Mr. Taylor you really had a bad performance and all those things going against Arsenal didn’t look good. But at the end of the day we spoiled your party. And if you really didn’t do it on purpose it is time to look at your performance on TV again. And see how you did all to take the speed out of the game, let the wall move closer without stopping it and not punishing the time wasting. Time to take your courses in your hands, time to try to the feeling of the game. Because on the things I mentioned you were more than poor. Only you know it was just being inept or being biased. If the first : do something about it and let the PGMOL do something about it. If the latter: shame on you. And you are starting to get a bit of history on those things I’m afraid to say.